Over $230K donated to multiple projects in Michigan, Ontario, Florida and Nicaragua. The BBC Foundation supports many initiatives to promote creativity and education amongst children and young adults. Creative thought and education are the keys to success. The BBC Foundation is proud to have provided creative writing awards to students at Grosse Pointe North and Grosse Pointe Academy, supported educational needs of underprivileged children in Michigan and Florida, and to have funded a summer drama program in Ontario. The BBC Foundation worked for 3 years to raise funds and to construct Brett’s First School in Nicaragua. The school originally started under a tree, and moved into an alley before the new school was built. In a country where only 51% of children reach Grade 5, a safe and secure school will help retain existing students and attract new students to get a basic education. Encouraged by the dramatic success of the First Brett Bentley Crawford School, the foundation has constructed a new school each year, with a fifth school planned for 2016. We completed our first school in 2012 and were literally astounded by the eagerness of the children to gain an education and the remarkable impact it had on the entire community. To our amazement, enrollment jumped from the 205 students attending the parent’s make-shift school to 624 when the new school opened, an increase in enrollment of over 300%. Brett’s Second School: Excited about the Foundation’s accomplishments and encouraged by the overwhelming success of the first school, the Foundation agreed to build a second school with the aid of SchoolBOX. This school was to be built in a rural community called 15 de Septiembre. This was a small community of families that had been forced to relocate after an earthquake destroyed their homes. So they started their settlement in an empty field in a very isolated rural area and built their rudimentary shelters so they had a roof over their heads. Enrollment in this school was about 100 when we announced the new school. When the school was completed enrolment rose to 210 students and continues to rise. 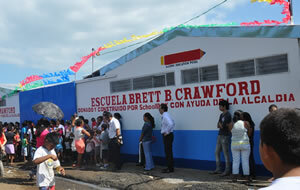 Brett’s third school was built in Jardines de Apoyo, another small community that had been relocated to a rural area. Lori and I had the opportunity to help lay the first blocks in the 4 classroom, 3 washroom building which replaced a dramatic open-air tent and ‘rancho’ structure where, for over 14 years, the children of Jardines de Apoyo fought the rain and sun in a quest for a basic education. Student enrollment went from 65 when the school was announced to 120 after the school was completed. The Fourth Brett School: Based on the exceptional success our Foundation and SchoolBOX demonstrated to the Ministry of Education with our first three schools and the additional schools SchoolBOX has built, they asked us to undertake the construction of our first school offering classes from kindergarten through high school. It is by far the largest school we have built to date and will accommodate 657 primary and 637 high school students. 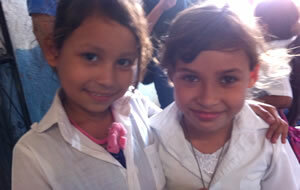 The school is located just outside of Managua, the nation’s capital. We accepted the challenge and for the past year have made a substantial investment and worked hard to complete the school. We are delighted to say the school is now finished and will be ready for the beginning of the school year in February! The Fifth Brett School: In 2016, the Brett Bentley Crawford Foundation worked hand in hand with SchoolBOX to build the Brett #5 School. Located in Masaya, the school began when Mirna Martinez, a community mother, began teaching children in her home who were too small to walk the long distance to the nearest school. Mirna Martinez then donated her own land to the Ministry of Education so that SchoolBOX and the BBC Foundation could build a brand new school with 2 classrooms and washrooms with running water. The Sixth Brett School: In 2017, the BBC Foundation completed their sixth project with SchoolBOX at Josefa Toledo School. The school, named after a famous Nicaragua feminist and activist for women’s education, was run down and overcrowded forcing the 5th and 6th graders to learn outside under trees. The three new classrooms at this school, completed in October 2017, will leave a lasting legacy in their community.